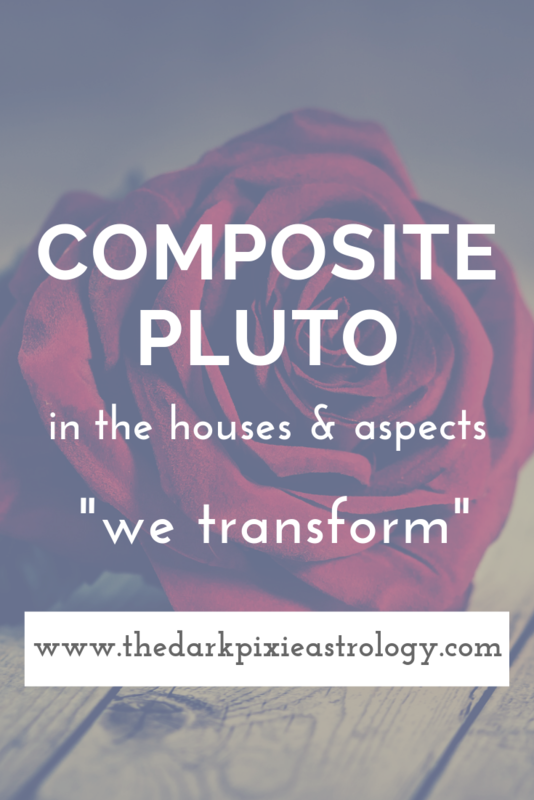 In the composite chart, Pluto can show where you may struggle over power and control, have some anger issues in the relationship, and where you may need to make major transformations together. With Composite Pluto in the 1st house, this may be a relationship where you’re constantly struggling over power and control. You have to show one another the respect to not try to dominate one another, but this can be difficult. This relationship can also serve to deeply transform you, and you can touch on issues that are deep inside of you and you;d normally avoid. The darker sides to each of you may come out together. With Composite Pluto in the 2nd house, you may struggle over power and control of your finances or resources. In a professional relationship, you can work through the difficulties and help one another to create even bigger wealth than you’d create alone, but you have to work on not controlling one another. In a personal relationship, selfishness may be a struggle, and you need to be more considerate. With Composite Pluto in the 3rd house, you may struggle over power and control in your communications, and one of you may constantly try to dominate the conversations you have and what you focus on. You need to make sure you’re hearing one another. You can make major mental transformations together, and have a different view of the world, but you can also be more pessimistic together. With Composite Pluto in the 4th house, you may struggle over power and control of the foundation of the relationship, and emotions can run high between you. You can get into epic battles at times, and need to be more considerate of what each other is feeling. In a family relationship, you may have great difficulties, and one of you can be more controlling. You have the ability to create deep change in one another with this placement. With Composite Pluto in the 5th house, love can be passionate and passion can be all-consuming. There can be obsession, jealousy, and clinginess in a personal relationship, especially a romantic one, and you need to allow each other to have some space, otherwise you suffocate. You can have strong creative energy between you. In a parent-child relationship, one of you may try to dominate the other, and you can change one another. With Composite Pluto in the 6th house, you may struggle over power and control in your daily life together. You can fight over the little things, and you may not fight a lot, but you bottle it up until it explodes out and you have complete resentment of one another. Avoid that by being more open. In a professional relationship, one of you may have all of the power, and this can cause many problems. With Composite Pluto in the 7th house, you may struggle over power and control of the relationship. You may each want to force your own ideas of how the relationship should be on the other, and you need to be more open and respectful. The relationship can serve to transform each of you, but you have to remember to treat each other with respect and equality, otherwise you just have drama. With Composite Pluto in the 8th house, this is the house naturally ruled by Pluto, so Pluto can be easier here. You can focus on what needs to be transformed together, how to share, and how to manage power. Deeply-held issues can run deeper, rage can be fiery, and passion can be intense with this placement though, and you can connect in a powerfully profound way. With Composite Pluto in the 9th house, you may struggle over power and control of your beliefs together. If you don’t have the same beliefs, you may constantly be trying to force your beliefs on one another, but that won’t work. You need to work on balancing optimism and pessimism in this pairing, and giving one another space because there may be a tendency to try to suffocate. With Composite Pluto in the 10th house, you may struggle over power and control of the way you’re perceived together, of the direction you’re going in together, and of your common goals. In a personal relationship, you need to allow one another to pursue your own goals without interference. In a business relationship, one of you may try to take control, but you need to be respectful. With Composite Pluto in the 11th house, you may struggle over power and control of your dreams together. You can dream big together, and feel you can do far more together than you can apart, making a big contribution to the world, as long as you allow one another to be yourselves. You can have more a more powerful network together, and transform the dreams you have for your future together. With Composite Pluto in the 12th house, you may struggle over power and control in ways that aren’t obvious. It can be in a subconscious way, and you subconsciously want to have all of the power and control. This position can show one person makes all of the sacrifices and the other person takes everything selfishly, so you need to make sure you’re both giving and taking equally. You can transform in profound ways together if you can steer clear of secrets, lies, and cruelty. With Composite Sun conjunct Composite Pluto, this is a relationship that can change each of you or your lives in big ways. The connection between you can be strong, powerful, intense, consuming at times, so you have to avoid getting sucked into the relationship and forsaking everything else. You also need to watch for struggling over power and control. With Composite Sun sextile or trine Composite Pluto, the relationship can be powerful without consuming you, and it can help you change and grow as a person. With Composite Sun square or opposite Composite Pluto, the struggle over power and control can be constant. You may have too much strife, play too many games, manipulate one another, or bring out the darkest parts of one another. A complete and total transformation may be required to have any chance of survival. With Composite Moon conjunct Composite Pluto, the emotions between you can be intense, which can make for a strong connection but also one that is challenging. The intensity can make loving feelings more powerful and difficult feelings more blood-boiling, so some moderation is required to keep you from going to emotional extremes. With Composite Moon sextile or trine Composite Pluto, you can help one another to explore your emotional depths, and feel a strong emotional connection between you, but not one that’s overwhelmingly so. With Composite Moon square or opposite Composite Pluto, the intensity of emotions can be off the charts, and it can be extremely difficult to get them under control. One or both of you may be manipulating, controlling, and you can bring out the darkest emotions in one another. It’s required for each of you to not go to those dark places or get sucked into negative emotions with one another. Find some light. With Composite Mercury conjunct Composite Pluto, this can be a relationship that challenges you to grow and evolve mentally, but it can also be one full of power struggles in your communications and over ideas. One of you may dominate the other in conversations, and equal communication is required. With Composite Mercury sextile or trine Composite Pluto, you can have great understanding between you, and you can learn a lot about yourselves in this relationship. With Composite Mercury square or opposite Composite Pluto, you can get into it over your thoughts and opinions, and need to allow one another to have differing opinions, otherwise you don’t ever allow one another to have room mentally in the relationship. With Composite Venus conjunct Composite Pluto, you can feel a strong link between the two of you, like you’re two magnets that are connected. The relationship can help you to transform and evolve, or it can consume you and become an obsession (even both sometimes). You need to not cling to one another. With Composite Venus sextile or trine Composite Pluto, the relationship can be serious and intense, but not overly so, and you can help one another to grow. With Composite Venus square or opposite Composite Pluto, the struggles over power and control within the relationship and of the relationship and one another can be difficult to control. You may manipulate one another, have secrets, tell lies, and you need to avoid giving in to your dark sides with one another. Don’t go to that lowest place. With Composite Mars conjunct Composite Pluto, there can be strong energy and drive in this relationship with one another, and when you have a common goal to focus on, together, you can get through anything to achieve it. The issue is that you may struggle over power and control at times, and feel that it’s very personal when you do. Try to be more balanced and equal. With Composite Mars sextile or trine Composite Pluto, you can grow in the relationship, and the extra energy can be easier to manage. With Composite Mars square or opposite Composite Pluto, the struggles over power and control between you can lead to some prolific fighting, and you can have such intense battles that are difficult to overcome. You can feel threatened by one another constantly, and that makes you stand your ground against each other. You need to stand down and not see one another and an enemy. With Composite Jupiter conjunct Composite Pluto, you can feel stronger together than apart, more powerful, and seem like you can conquer anything together. This can be a powerful aspect to have, but it can also lead to an abundance of power struggles and control issues if you’re not careful. With Composite Jupiter sextile or trine Composite Pluto, you can transform in the relationship, understand each other and yourselves better, and find more opportunities for change and growth. With Composite Jupiter square or opposite Composite Pluto, there can be too much fighting between you, too much struggling over power and control, and you can get stuck in the dark side of the relationship. There can be an abundance of dark energy in the relationship if you don’t let the light in. Uranus, Neptune, and Pluto are slow-moving generational planets, and so their aspects to one another usually aren’t as important unless there is a major age difference.